Let's face it, killer dinos just aren't as scary on a 25" Trinitron. But this third outting still has some fun in it if you turn out the lights and turn up the volume. Director Joe Johnston ("Jumanji") steers "Jurassic Park III" faithfully through the franchise formula of trapping a handful of scientists, civilians and at least one smart kid on the island overtaken by dinos after it was abandoned by the greedy genetics firm that spawned them in the first film. The excuse this time: A hardware store owner (William H. Macy) and his ex-wife (Tea Leoni) pose as millionaire adventurers offering to back a big research project if series staple Dr. Alan Grant (Sam Neill) will be their tour guide on an illegal charter flight over the island. Real motive: Their 12-year-old son (Trevor Morgan) disappeared while para-sailing in the same locale (also illegally) on a bonding trip with his mom's new boyfriend. The plane, of course, crashes after a close encounter with the ominous new Spinosaurus -- a savage, 45-foot carnivore with a crocodile snout and a big, bony fan arched along its back -- and it isn't long before everybody is on the run and expendable cast members are being eaten. "Jurassic Park III" is largely a blockbuster B-movie exercise in Filmmaking 101, but it just so happens this is Johnston's specialty. He's a director who can take the most ritualized script and turn it into wonderfully entertaining fare, as he did with 1999's "October Sky" and 1991's "The Rocketeer." Fending off the occasional well-organized Velociraptor hunting party (it's implied in the story that Raptors are far more intelligent than scientist have suspected before), our protagonists eventually find the resourceful kid, who has survived by hiding out in an overturned tanker truck and developing his own camouflage. Hoping to get rescued, they make for the coast through "Spino" territory and a colony of voracious Pterandons (the flying dinosaurs). But Neill's paleontologist pal (Alessandro Nivola) can't resist swiping some Raptor eggs from a nest, which turns the second half of the movie into a hide-and-seek game as the angry reptiles come after their ovum. This picture has its problems with logic (either Spinos know how to make satellite phones ring or some other explanation got cut out of the movie) and, ironically, in spite of the incredible computer effects there are some conspicuous soundstage and green-screen moments that don't even involve the dinosaurs. Luckily, Johnston knows enough to move past such moment swiftly and quite literally cut to the chase. 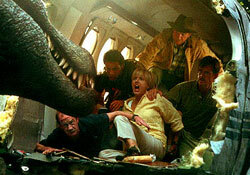 Over-produced and highly predictable, "Jurassic Park III" really isn't all that thrilling. Let's face it: If you've seen one "Jurassic Park," you've seen them all. But there is just enough innovation here to propel this second sequel beyond its highly contrived immediate predecessor (the actually boring "Lost World") and into that movie quality limbo I like to call "OK as a bargain matinee."